You usually only get one shot in a real hunting scenario so why practice by only shooting groups? If your bow sight is dialed in, then shoot one arrow at one spot on your target. If you have a target with five circles, challenge yourself to put one arrow inside each circle. Also, your shot on a bull or buck is a “cold shot,” meaning you did not get a chance to warm-up and get into a rhythm before taking it. Take a single shot at a target at a given distance at the very beginning of your practice time to get a feel for how accurate you are with a cold shot. This can often be very telling. You do not have all day to take a shot when you have an elk standing broadside. In fact, you may have a very small window of time to execute a good shot. Using a timer, practice executing the entire draw and firing process within a set window of time without accuracy diminishing. Over time, work to progress through the process quicker while still maintaining proper form and release. The key is to hold yourself to the same standard of accuracy while working to become more efficient with your time. 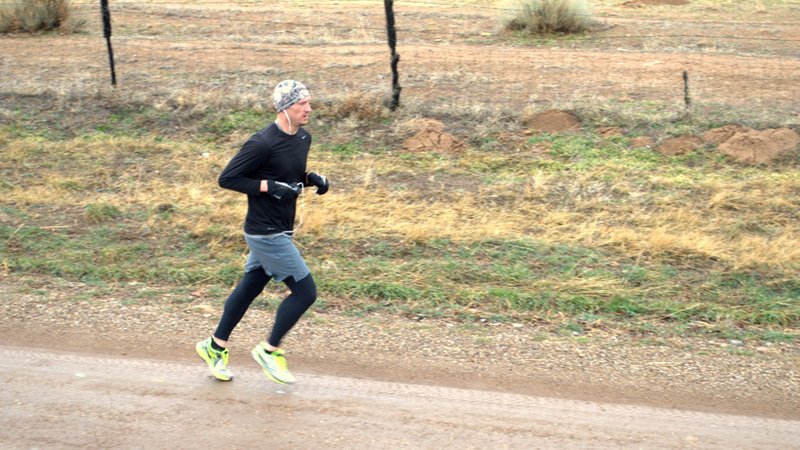 If you notice your form breaking down and your accuracy suffering, then give yourself more time and start working toward building back up to the smaller time window. This will prepare you to be more accurate in scenarios when you would have otherwise rushed a poor shot. One thing that causes us to rush shots is adrenaline. The rush of having a buck or bull within bow range can cause even the best archers to have a lapse in form. While the effects of adrenaline on your fine motor skills and mental clarity cannot be removed, you can train your body to work through the physiological response better by training with an elevated heart rate. To do this, do a 30 second to one-minute fitness regimen right before shooting. An example would be 10 burpees, 20 jumping jacks and 20 push-ups. This is not enough to physically exhaust your muscles, but it will certainly force you to be more focused on the execution of your shot. The next step from practicing with an elevated heart rate is practice immediately after (or during) extended physical exercise. This one will be tougher to pull off if you shoot at a local indoor range, but it can still be done. 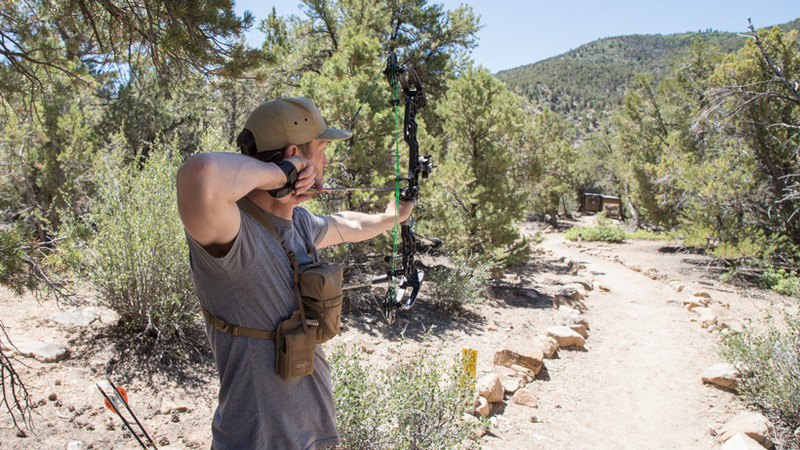 You should already be exercising regularly (for both your health and your backcountry fitness level) so it is really as simple as planning to go to the range immediately after your workout. Your muscles will be fatigued and you will be able to simulate the feeling of drawing and executing a shot after a day of hiking through the hills. Utilize the timer and do the exercises listed above to get your heart rate up just before the shot to further the simulation. As with all of these different methods of practice, the goal is to execute a good shot and see no reduction in accuracy. I have never taken a shot at a deer or elk from a perfectly flat, standing position at exactly 20 yards. Instead, I have taken many shots from kneeling or standing on an incline/decline or uneven surface. I have had to shoot through small gaps in trees and move my torso laterally to get my bow out from behind a bush. All of this shows that you need to practice the same way. Spend time taking shots while kneeling or sitting. Go out to the woods or the desert with a target and practice shooting in the brush through tight windows. Get as much exposure to shooting from every position and scenario that is unlike a range as possible. This will ensure that you are ready to make a good shot on that bull or buck. 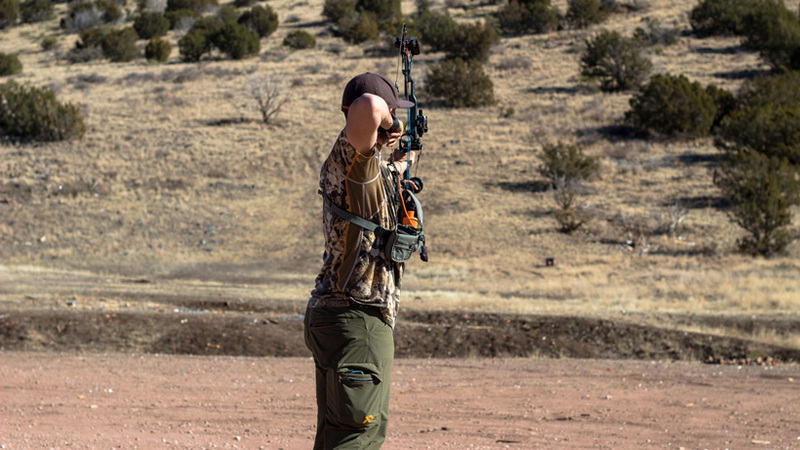 I have seen it happen way too often where someone practices in shorts and a t-shirt all summer and then is uncomfortable drawing his bow at the moment of truth because of his bino harness, pack and multiple layers of clothing. Drawing and shooting in the woods should be second nature by the time you have to make that shot on an animal. This means that your practice should mirror a real hunting scenario in every way possible. As such, if you could see yourself wearing it while hunting, you need to wear it while practicing. Maybe not all the time (I cannot wear multiple layers when practicing outside during Phoenix summers), but as often as possible you should be adding your gear into your archery practice. Wear your bino harness, your pack, your gear belt and gloves (if you will be wearing gloves while hunting). Become accustomed to shooting with a jacket on if you will be hunting in places where it might get cold during your hunt. Shoot with your rain gear on and with or without a hat. All of these things can affect your accuracy if you do not practice with them so use the time in the offseason to get used to wearing them. 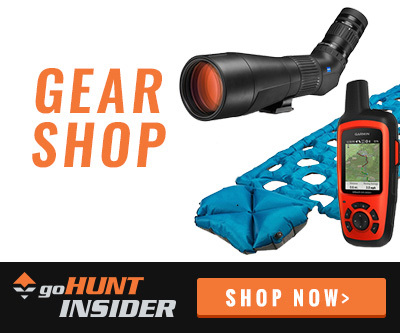 Put on all of the gear you might be wearing while hunting. 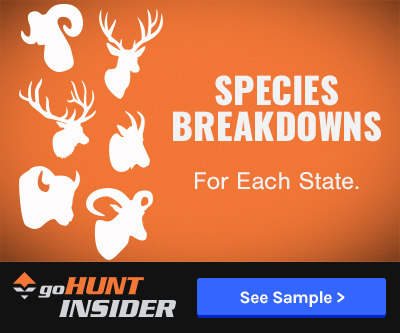 Set a target at a specific distance that you might reasonably expect to shoot during a hunt. Perform exercises to incite muscle fatigue and get your heart rate up. Have someone start a timer for a predetermined amount of time when you have completed your exercises. Come up to the place from which you will shoot, kneel down and execute a single shot before time expires. Challenge yourself or a partner to be more accurate and quicker than the previous attempts. I've been archery hunting the mountain west for 24 years now, harvested over 40 bull elk, 20 mule deer with several over the 180" mark, two mountain goats, and several coues and whitetail deer all while hunting DIY. I have hunted in just about every western state with archery tackle and feel as though I've seen about every situation imaginable! I only state these on the premise that I still fell like I learn something new every hunt, and am FAR from an expert!!! All these tips can be very helpful when applied during practice sessions. Much like any article, pick out the sections you like and utilize them, and if nothing else to increase your repertoire as an all around archer. If there is one thing I feel like an expert within the archery field, it is that when you think you are an expert and have mastered everything, you will most certainly be humbled in your next archery hunt! Great article! This will be very helpful as I begin planning my first archery hunt. Hey, good article. I am planning on working more on my archery hunting this year and I will be putting all of these ideas to use. I would even add one more, and that would be that you should also practice holding your draw. 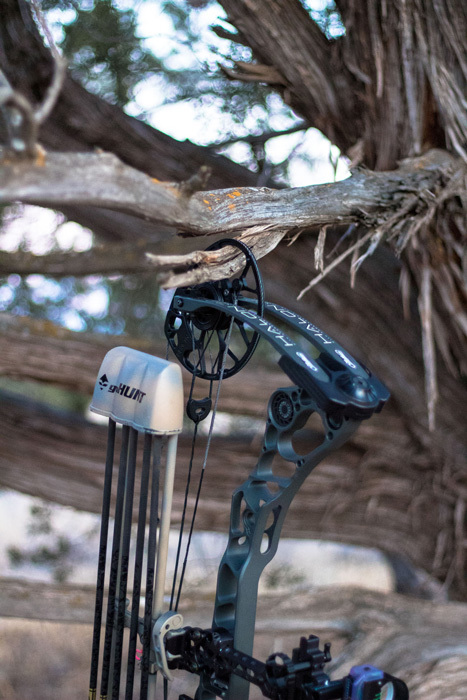 To truly practice for all the different scenarios you need to also practice for that time you need to hold at full draw for long periods while waiting for that trophy to step out from behind a tree! 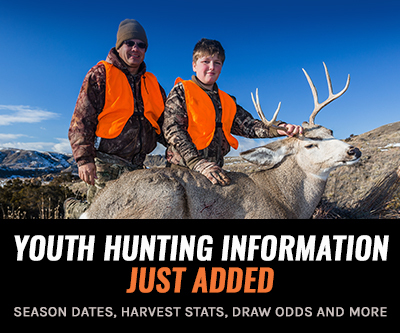 good tips.. i would add making sure you are as comfortable letting down as you are drawing and to practice with your broadheads. One day I plan to be an expert by success and experience like Melvin. Thanks for the feedback, I thought it might be worthwhile to address some of your comments. First, the author is not advocating "speed shots" rather he states "practice executing the entire draw and firing process within a set window of time without accuracy diminishing". Shot timing is something every top level archer in the world works at. Accuracy boils down to repetition and consistency and you are indeed more steady in the first few seconds after you arrive at anchor than you are during the later stages of holding. I think the point he is making is that you should work on your focus..i.e. work through a draw sequence and execute a shot efficiently. Shot timing an consistency absolutely matters. Second point, there is real value in "cold bore" practice. He's not making the point that you should only ever shoot one arrow during practice sessions. Rather he's making the point that when you draw, anchor, and executing a shot on an animal this is how it happens and it's worth practicing specifically from time to time that scenario. Certainly, accuracy is built upon repetition and "cold bore" accuracy is built upon thousands of practice arrows. You don't become lethal one without the other. I think he's just making the point that there is real value in that type of practice, as well as repetitive practice. Thanks again for the feedback, all the best! I really like shooting in the several 3D tournaments within an hour or so from my house. All kinds of yardages and different looks. It's good advice to mix up your practice routine and these are some good ideas to do that. I would add the need to practice in very low light conditions. It's a different visual through your peep 15 minutes before sunrise versus the middle of the day. And the more arrows you put down range in those low light conditions will make you better prepared for that scenario in the field. Unlike Melvin I think all of your points are valid. I don't think you were lying or being deceitful at all. I'm assuming that you don't always practice one shot, unorthodox, full gear, timed shots. These are situational practice sessions that help you gauge where you are and where you want to be as an archer/hunter. 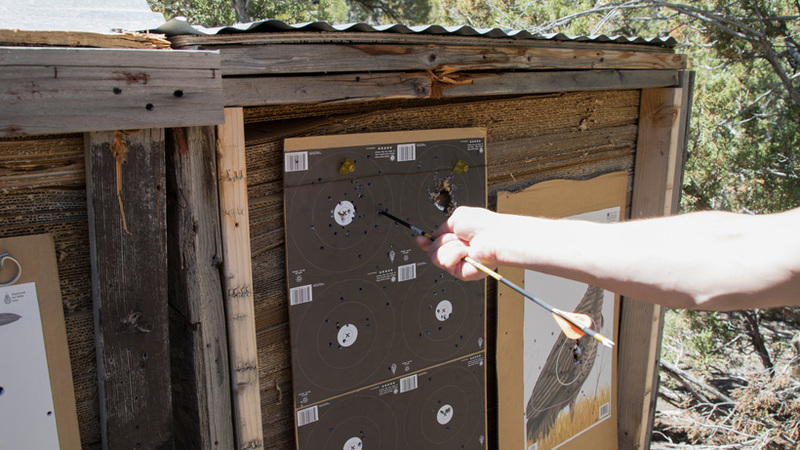 3-4+ arrow sessions are still required to develop muscle memory. I love shooting with my friends and consider part of the fun of preparing for the upcoming season. They help me become a better archer. Great article, thanks for sharing it!